Sometimes our customers are so talented, that our job is made easy. With this couple, the idea was sketched out on a Starbucks napkin. 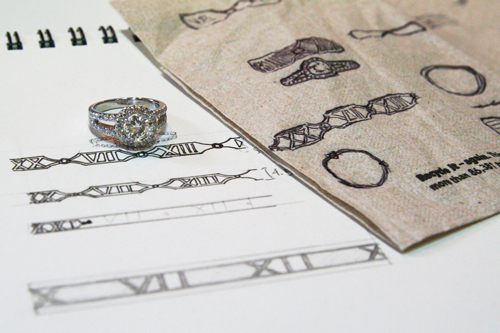 They needed a design that could fit nicely with the engagement ring, and in the problem solving process they came up with this beautiful and clever design that makes use of their wedding date translated to roman numerals. 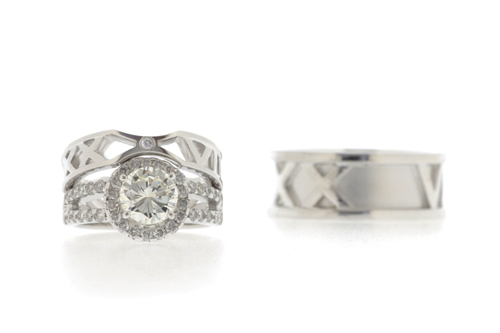 Based on the first sketch, we then refined the design; we measured, sketched and planned how to get the rings to look their best, in terms of proportion, polish and design. Checking that the wedding ring sits nicely together with the engagement ring, before polishing and setting of Diamonds. Because of the engagement ring, the lady’s ring was the one that took the lead, and when that was done, we could create a matching one for the gentleman. 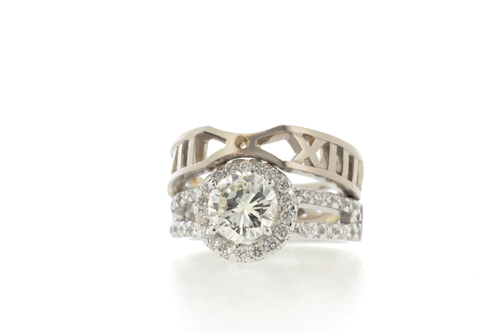 The Men’s ring also has roman numerals, but was made chunkier and solid, to fit his style better.